1. Firstly, paint your plant pot using the DecoArt chalky paint until it’s completely covered. We have used the colour, ‘Everlasting’ for our pot. 2. Once dry, add two googly eyes to the front of your pot for eyes. Next, cut a small triangle out of the pink First Edition textured card for the nose. Use a 3D foam pad to attach your nose to add dimension. If you don’t have googly eyes, we’ve included a set of eyes on our template that you can cut out and glue to your pot. 3. Next, print out our free template and cut out each section. To make the ears, take the small ear templates and draw around them onto pink First Edition textured card, then cut out. 4. To finish your ears, draw around the larger part of the ears template onto cream First Edition textured card and cut out. Attach the pink card you have cut to each ear with 3D foam pads. 5. Take your two long strips from the printable and draw around them onto cream First Edition textured card, cut out and put them to the side. Take the smaller strips from the bottom of the template and draw around them onto the cream card also, these will be your tabs. Fold as shown on the template and make the tab by gluing together the two edges that overlap. 7. Attach your ears with double sided tape to the inside of your circle band. 8. To fill your pot, you can either use tissue paper that is already shredded or you can rip the strips yourself. Now your Bunny Pot is ready to fill with yummy treats! You can print our template as many times as you like so you can make your whole family resemble Easter Bunnies! 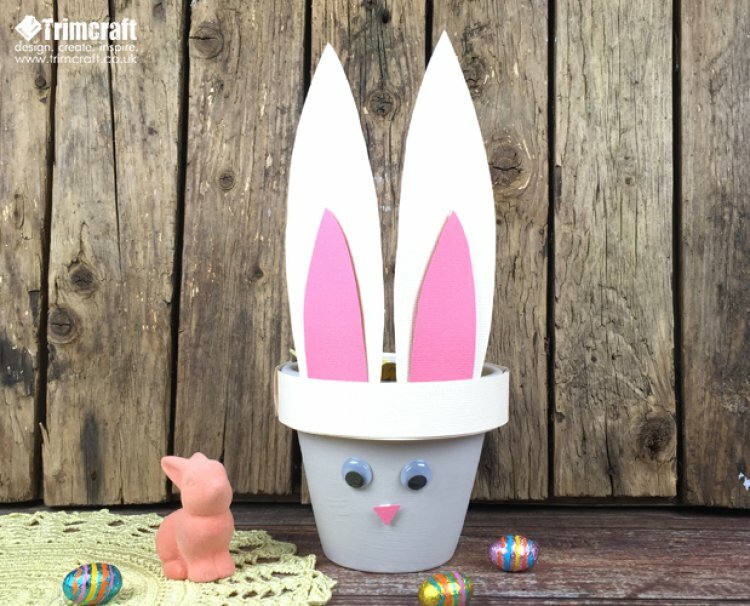 This project will definitely be great fun with the kids this Easter holiday, (though we don’t think the pot will be filled with chocolate for long!) We can’t wait to see your own bunny pots in the project gallery and make sure to #Trimcraft to show us your wonderful makes on social media too!